China’s leaders have made “Ecological Civilization” and a “Beautiful China” two of their most prominent slogans. But underlying these buzzwords is a complex, unenviable and worsening problem. China’s environmental and climate governance is at a crisis point: while China attempts a transition to a more sustainable model of development, a difficult enough process for one-fifth of the world’s population, political structures and powerful interest groups have made necessary reforms all the more difficult by restricting, rather than harnessing, the potential for citizen participation in environmental protection. As recent headlines have illustrated, creating a “Beautiful China” will be no easy task: one-fifth of China’s land is polluted, according to a recent report from the Ministry of Environmental Protection. Nearly 60% of the country’s groundwater is of poor or extremely poor quality, according to the Ministry of Land and Resources. The government in the city of Lanzhou, in northwestern China, recently admitted that oil from a petrochemical plant had leaked into local water supplies, but questions remain over the reporting process, and whether an ongoing problem had been covered up. For many people in China, such dire assessments will not have come as a surprise. Chinese officials admit that pollution may have become the nation’s single greatest cause of social unrest. Last year, local authorities in Guangdong province, in southern China, bowed to this rising discontent when they cancelled the construction of a US$6-billion uranium processing plant, after protesters took to the streets. The protests, and the local government’s last-minute turnaround, are phenomena that increasingly worry senior government officials: the spectre of urban discontent, amplified by the growth of new media and mobile computing, looms large for China’s decision-makers – as does its potential to derail economic development plans – and the social unrest that is feared if economic growth were to falter. China’s rhetorical push for an “Ecological Civilisation” accompanied an ambitious raft of top-down environmental targets, regulations and policies, not least those launched under China’s 12th Five-Year Plan, for 2011 to 2015. But despite the laudable ambition of such moves from the top, it is a common misunderstanding to assume that China’s political structures facilitate rapid and effective policy implementation. In reality, power in the People’s Republic is highly negotiated: policies, laws and regulations are not only weakened through protracted bargaining among bureaucratic elites, but also frequently ignored further down the system. China’s phenomenal growth over the past three decades was unleashed in large part through the considerable devolution of power from the centre, which spurred economic competition between regional government chiefs. But one of the costs of this arrangement has been an ecological race to the bottom, where collusive alliances of money and power at the local level commonly trump environmental regulations. Prominent green projects launched from the centre have often turned out to be less impressive than the rhetoric accompanying them. For example, Jiang Kejun told chinadialogue in 2010 that most of China’s “low-carbon” city projects were not “genuine” and that many of these cities were still very much on high-carbon development pathways. Opaque decision-making and restricted public access to implementation mechanisms add to the difficulty of uncovering such problems, and indeed of predicting whether any given policy will be effective. A culture of official secrecy, one that extends into the realm of the Internet, hampers effective environmental governance, as does a weak civil society, with NGOs still facing a highly restrictive registration process. 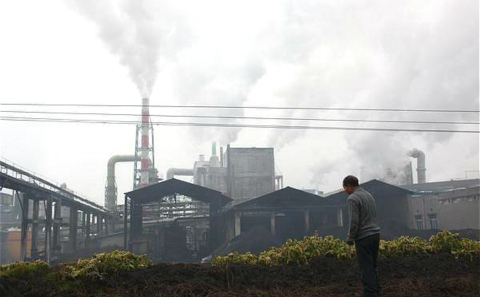 China has introduced laws and regulations that provide for public participation in environmental decision-making – encouragingly, the country’s revised Environmental Protection Law gives around 300 green NGOs the right to bring public interest lawsuits – but, in common with other environmental laws, the existence of such laws and regulations on the books is no guarantee of their effective implementation. Furthermore, conflicts like the one over uranium processing in Guangdong point to the likelihood that China’s attempts to meet its climate goals may increasingly clash with other ecological and social concerns. The 12th Five Year Plan, while incorporating concerns about the environment and climate change, also promises a kickstart for China’s nuclear industry and a push for energy from big hydro on the country’s southwestern rivers – opposition to which gave birth to many of the current generation of China’s environmental NGOs. In other words, China’s social and environmental conflicts are unlikely to reach consensus any time soon. The challenge for government is to institutionalise greater public participation in environmental decision-making not only to benefit green development, but also help to address a deepening social conflict that is being exacerbated by poor policy responses. Still, there are hopeful glimmers in the smog, including a flourishing of new initiatives by Chinese green NGOs, journalists and networked citizens, sometimes in coordination with officials who have recognised the need for more open and responsive government approaches to sustainability. The online “storm” of citizen complaints on microblogs for the release of real-time information about airborne concentrations of PM2.5 was one such example, as are citizen-science efforts, like those advanced by FLOAT Beijing and the environmental NGO Green Beagle. These campaigns have built on the efforts of pioneers like Ma Jun, whose organisation collects publicly available information to build maps of environmental data, including air and water pollution, and even of the levels of data transparency in different cities. One of China’s best hopes is that it might harness these emerging forms of public participation and open information, particularly in the new media context, to help address its environmental woes. For a number of years, China’s Ministry of Environmental Protection has operated a hotline for citizens to phone in tip-offs about pollution incidents and environmental infractions. Now China’s environment authorities have started to use microblog accounts at many different levels – in many cases to complement this approach, by engaging in two-way communication and listening to public opinion. Encouragingly, the Environmental Protection Bureau in Chongqing, in south-western China, has a microblog account for each of its 40 districts. China will need to navigate these new forms of grassroots public engagement if it is to improve environmental governance during its complex and ambitious transition to a cleaner, low-carbon economy. This will require a commitment to greater transparency and to full and early public participation in environmental decision-making, opening a space for citizens to express their own visions of an "Ecological Civilization". something you mention about grassroots participation does not only come from NGO's but as I experience on a daily basis from private investments and initiatives. We spent the last years talking to many different private investors and finally this now bares fruit with our innovative approach to solutions for air, soil and water pollution by incorporating all these elements into our proposals and working closely with the local people and Chinese scientific community. I never underestimate the power of the Chinese mind and with a little convincing evidence the will to change things radically with in this case our European approach to the environmental problems China faces. Climate change and pollution are not national issues anymore but get more and more integrated into a global network of people which can apply solutions wherever these have a market. China's people are all aware that we have to change our ways of consumption and we will do whatever it needs to open their eyes to solve this challenge.